In Philadelphia this weekend? 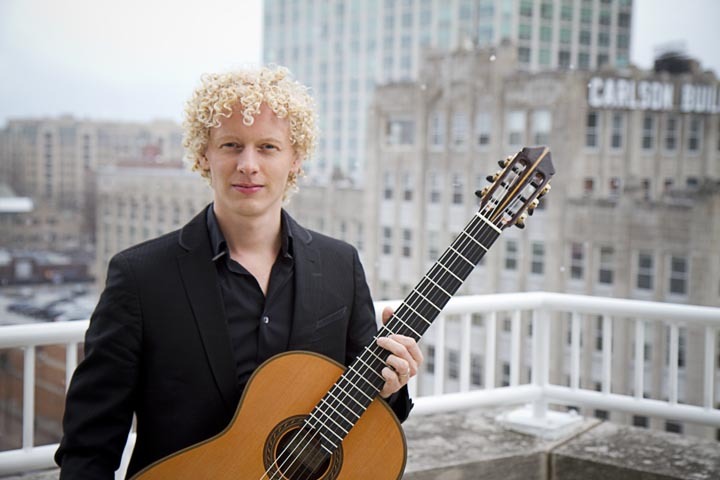 Don't miss a recital featuring the 2010 PCGS and 2010 GFA compeititon winner, Johannes Moller at the PHILADELPHIA CLASSICAL GUITAR FESTIVAL 2012. This weekend, Saturday April 14 & Sunday April 15. Kenny Hill will be there featuring 2 Signatures 2 Performances and a Signature Stand up model. 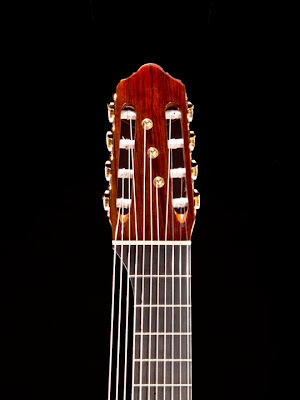 This week we finished up an 11 string Performance Series guitar, custom ordered by Matt Gabrio from Washington State. This is an instrument designed to play music from the renaissance and baroque periods, written for lute. Most of that music is written in tablature, not really playable on a 6 string guitar, at least not without serious transcription. Using this 11 string guitar and appropriate tunings, the music of Bach, Weiss, Kasperberger, Dowland and so many more can be played with all their original voicings, but without the expense and difficulties of owning a lute or two or three. This music is really sophisticated, and when played in historic tunings has a pastoral and transcendent character that just doesn't quite translate to a 6 string guitar. The original idea for this came from Terry Schumacher. 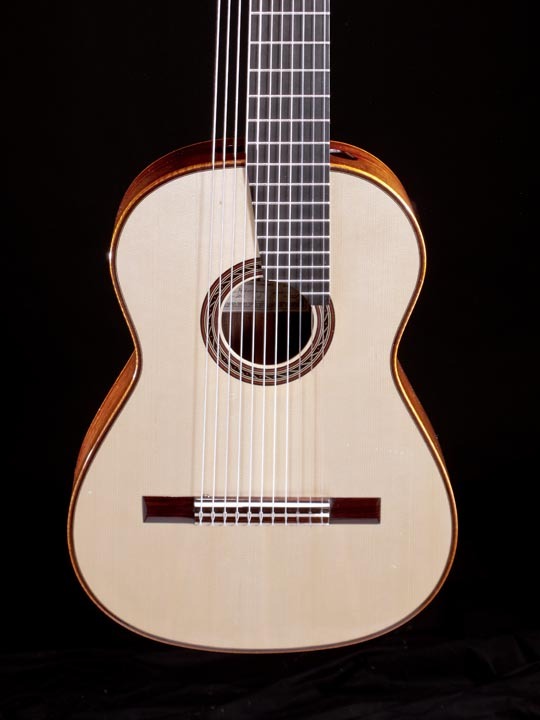 He wanted a guitar that could be acquired by college music departments to give students access to several hundred years of beautiful music written entirely in tablature. We collaborated on this general design about 10 years ago, and made maybe 10 pieces. I've heard some great recordings from those prototypes. This current one has the same overall design elements, but is updated with a double top, lattice bracing and sound ports. 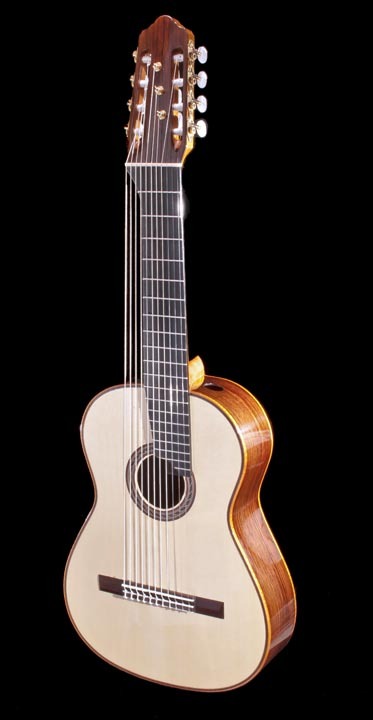 It seems very alive and sparkling, with the sound and dynamic qualities that I expect from the Performance Series. It's a hybrid, a modern instrument made for playing very old and traditional music. For me it's a little un-nerving to string it up, because it's quite confusing for me to try and play so many strings! I expect the new owner will put the time in to really learn how to use it, and I look forward to hearing the music that comes out of it. Kenny, Larry and all who worked on the 11-string for me; wow. What a work of art. 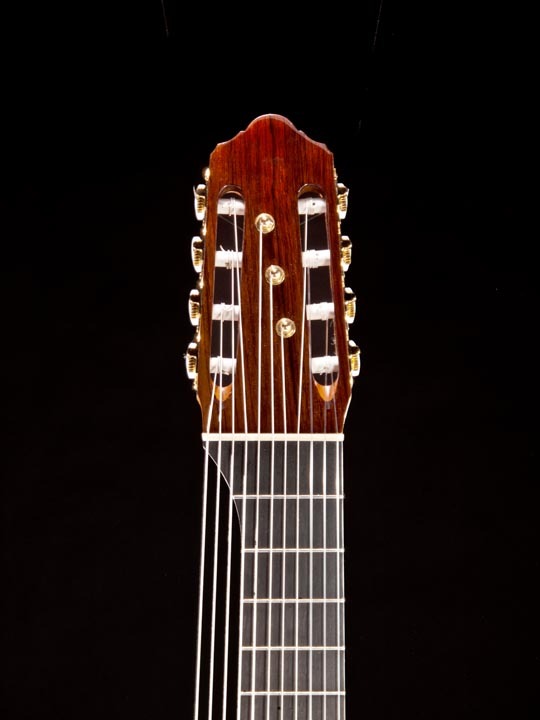 This instrument is the first concert style guitar I've had since I parted with my 1964 Miguel Rodriguez(which now sits behind the glass at Rosewood Guitar, for the most part unplayed -sigh-) and I must tell you I've never been happier with a guitar. The sound is even, full, clear, and extremely well balanced. I love you all. Fantastic work! When I'm ready for a new 6-string, I'll be having you build it. p.s. When I record a youtube at quaver studios, I'll be sure to send you the link. We'll look forward to hearing that Matt!